Why an overnight on this tiny windswept island? At the last minute, we thought we might have to cancel our trip. We had been on the road for only 15 minutes when we received a call from our motel proprietor on Tangier calling to warn us that the rain was coming down fierce creating turbulent water for the boat ride over to the island. Although we were driving through the middle of a downpour ourselves, we decided that we would make the trip anyway. We did pull off at the nearest drugstore to buy more seasick medication. 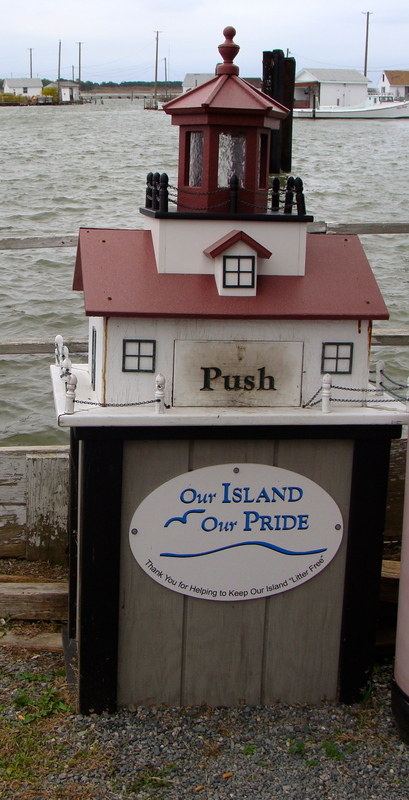 By the time entered Crisfield, our docking town, the sun rays streamed through the clouds, but the influence of the weather continued to follow us during our stay on the island. Remote island societies slow the cultural clock, as happens on Tangier where everything from their language, occupations and way of life varies from the mainstream. Linguists have studied their speech, as the islanders speak a unique restoration era dialect of American English with language roots in Scotland and Cornwall. We noticed that when native residents spoke to one another, we could barely understand the conversation, with varied intonations and a unique linguistic cadence. Without fast food restaurants, chain motels, traffic and cinemas this tiny community contrasted dramatically from our suburban bubble. But outward appearances can be deceiving; what the “soft shell crab capital of the world” shares with its mainland neighbors are economic and environmental problems. Hard-working watermen continue to eek out a living from the increasingly polluted waters of the Chesapeake Bay. According to Wikipedia, the per capita income for the town was $24,042. About 22.6% of families of the population live below the poverty line. The watermen resent government regulations and question whether they are being the scapegoat to all the Bay’s environmental problems. If regulations restricted fertilizer runoff, for example, crabs might flourish. Tangier barely rises above sea level and water floods the entire island during storms or high tides. We ignored the phases of the moon, which also came into play during our visit. At the marina at Cristfield, a working fishing village on the Western Shore of Maryland, we boarded the ferry for the 75-minute ride to the island. With predictions of stormy seas and given my weak stomach for drastic up and down undulations on the waves, I became somewhat hesitant to step on board. Over an hour on the water seemed like a long ride especially in rough seas, but the process of a journey begins to set my mind apart from where I’ve been to where I’m going. The seas rocked the boat from side to side, but thanks to medication, we made the trip fine. Before reaching the dock, the ferry passed through the crab shacks, traps piled high on their piers. On arrival, we began to walk to our motel, The Sunset Inn, when we were offered a ride in the back of a pickup truck. Our driver told us we probably couldn’t traverse the water-covered roads with suitcases, and he was right! 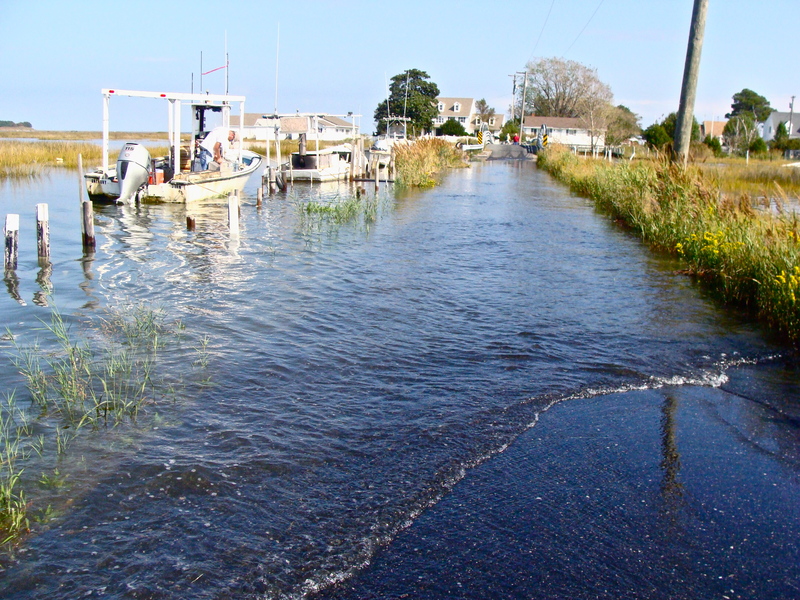 The road disappeared under eight inches of water, and tidal waters surrounded the most of the houses. Higher ridges separate the homes from the marshes and tidal canals. Wooden arched bridges connect the two main streets that run parallel the length the island. We read that the island was sinking, and it seemed as if it was sinking as we rode along! The nice folks who offered us a ride left us off near our motel only a short walk away. We settled in becoming immediately acquainted with seven of the island’s friendly cats. One snuck into our room, and immediately being purring upon being picked up and carried out. We learned from our motel manager that an animal organization fixed all the cats on the island to control the population. We decided the golf cart transportation would be essential to get around the island, even if it was just three miles by one mile. We returned to the dock area where we could rent a cart. Our motel manager’s husband gave us a ride into town. He proudly said that he was a waterman, born and bred. For all their hard work, watermen receive only $14.99 for a bushel basket of crabs. Since the island’s primary business is crabs, we ordered crab cakes for our dinner and were not disappointed. 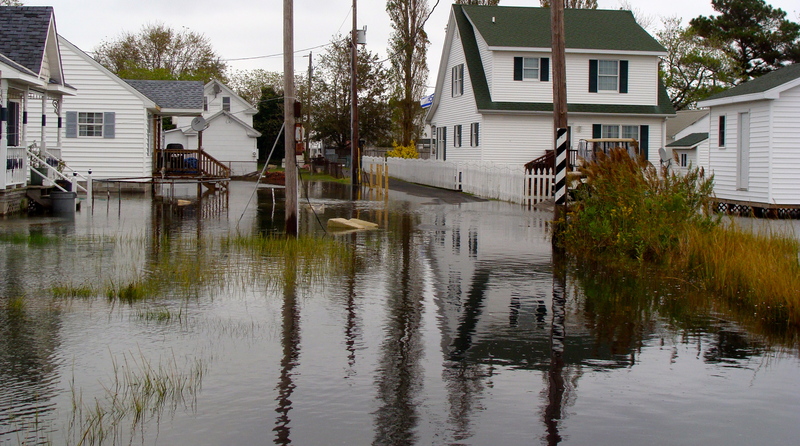 By the time we finished, the tidal waters had receded, and we made our way back to the motel. The beach was just at the end of our road so we followed the path through the high reeds. A deserted sandy beach stretched before us, but we did not linger as mosquitoes began to hum around us. The next morning we set out to explore the island. We rode to the airport area and through the streets of the main village. We paused to watch the snowy egrets fishing in the marshes. We stopped for supper at Hilda Crockett’s Chesapeake House. A family-style meal, we had plenty to eat with homemade hot bread, corn pudding, crab cakes and oyster fritters, just to name a few of the total nine dishes served. 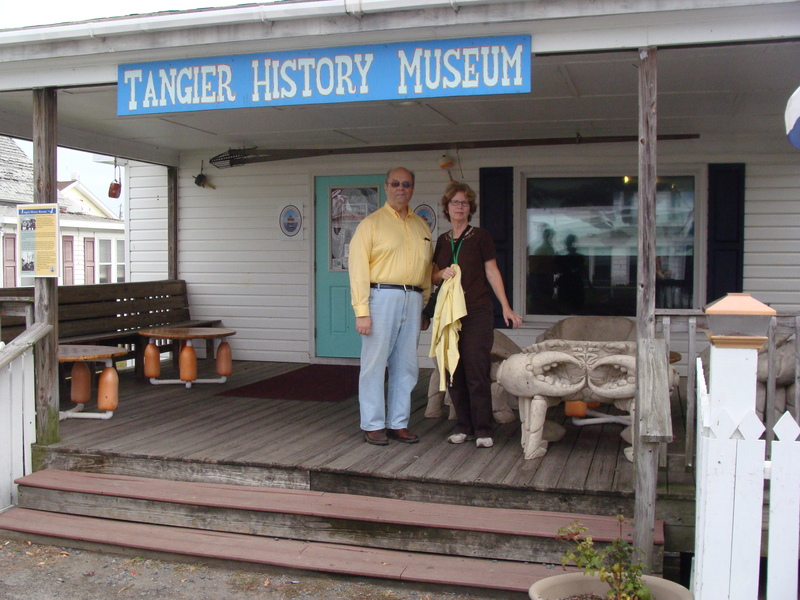 Afterward, we stopped at the Tangier History Museum, viewed the exhibits and saw a short movie. We were watching the clock for our 4pm departure as we had left our suitcases at the motel on the other side of the island. What we failed to watch was the tide schedule; and the tide was unusually high, like the evening before. We headed down one alleyway after another only to be blocked by rising water. With only little more than an hour before our ferry would be leaving, we unwisely decided just to plow through the rising water. Of course, our cart stalled. We had no choice but to jump into the water and wade back to the motel to pick up our gear. When we returned to the cart, we piled our luggage on the seats and began to push it back to the depot. Some folks, seeing our predicament, suggested that we leave it and walk back. One last time, we tried to start the motor when lo and behold, the engine turned over. Quickly we hopped back in the cart and made our way to the ferry in enough time. 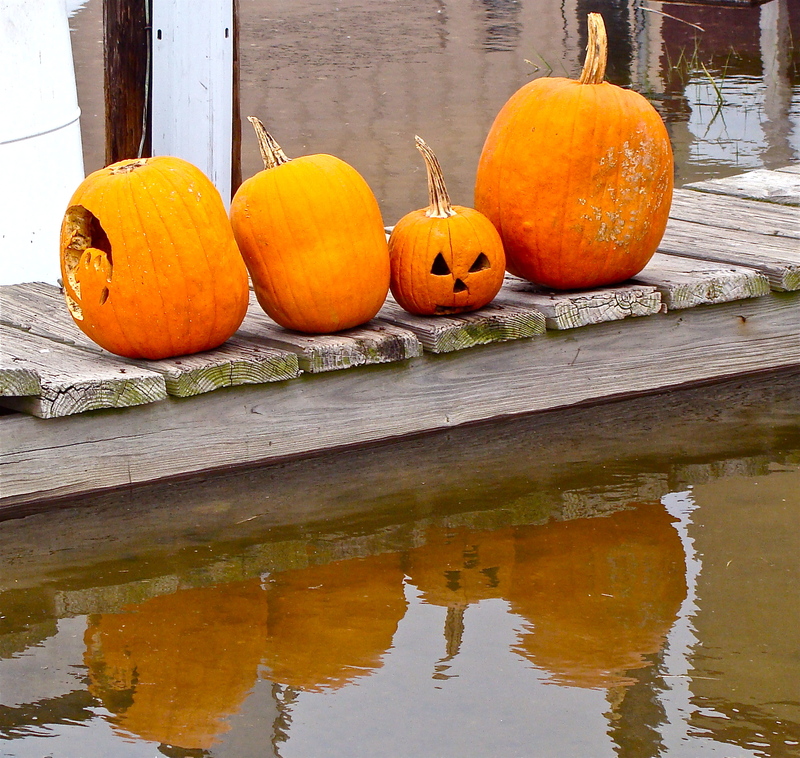 October is the time of year when folks decorate for Halloween and some will include graveyards and other scary displays in their yards. 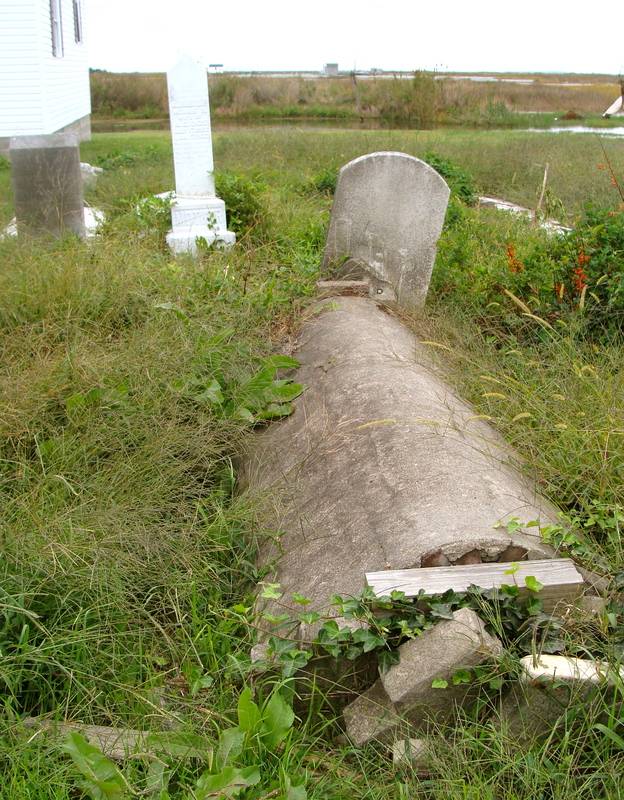 On Tangier gravestones in the front or back yards are not unusual, and these are real! Several explanations offer reasons for the custom. The island experienced four epidemics, beginning in 1866 with Asian cholera. Because the death rate was so high, bodies had to be buried quickly. The residents were hardest hit in the early 1870’s when tuberculosis, measles, and smallpox epidemics hit the island. Also, centuries ago American and Britain families often buried deceased relatives in their yards and the custom persisted. Several recent graves we observed still had funeral flowers atop the mounds. We were treated to another history lesson on our voyage from Tangier back to Cristfield when by coincidence we sat across from Dewey Crockett, a native islander who served as mayor, undertaker, medic, teacher, church music director and assistant principal. We learned that residents have to wear many hats in a small community. The Islanders have resisted changes that have altered the mainland, such as alcohol, lotteries and even a movie deal. Dewey said that because everyone knows each other it is easier to keep an eye on the children, who still find the enjoyment of playing sports or running skiffs across the marshes. 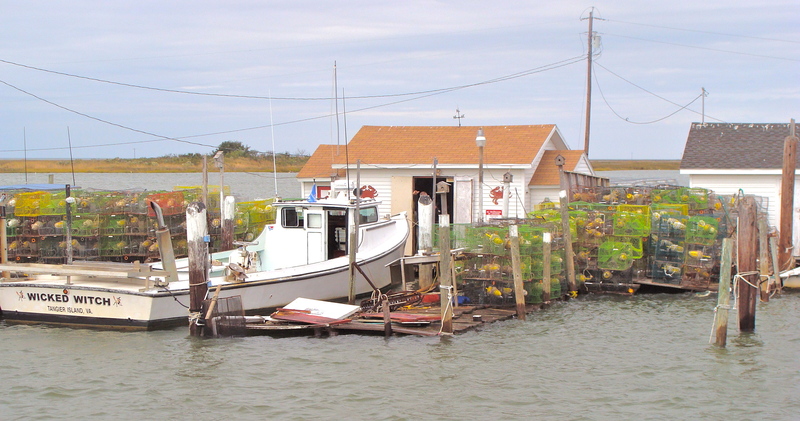 The watermen support Tangier Island’s population of 525, but according to Dewey, fewer young people are choosing a career as a waterman. The graduating classes have become smaller, and the State has not replaced retired teachers. Some illegal drugs have worked their way to the island. The tourist industry has helped the economy a bit, but it remains a question whether the island can continue to exist with the dual pressures of modernization and global climate change. Generally, the social hierarchical structure is fairly flat. The houses are small, and structures, while preserved, are not modernized, with the exception of the community health center. For children, the island would seem like a paradise with the freedom to run through the allies and gravestones and to venture out in the marshes in small boats. The Islanders seem to love their island and their life there. I can feel invigorated by the salt air and stormy skies but almost impossible to capture what these folks experience in their close-knit community. If global climate change destroys this culture, the loss will never be recovered.